Running Time: 5 hours and 50 minutes total. A 3-disc set. 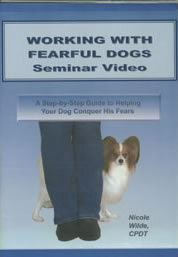 Note: Although this seminar DVD is marketed to trainers, it is also appropriate for owners, rescue and shelter workers, vet techs, and anyone who works with fearful dogs.